So I have had a Reference Pure for about a year. When I first got it (new by the way), the kit needed to be cleaned as it had a gross film on the finish. I assumed this was from being stored in its boxes and in those strange felt bag/wraps. So as I do with all my kits, I stripped all the hardware and cleaned and waxed all the shells and hardware/hoops/mounts. The kit cleans up well and things were looking good. About 6 months later I begin to notice a film developing on the finish. Its the same film/haze the kit had on it when I first bought it. So I grab a microfiber towel and wipe it off. Here it is 6 months later and the finish has the same damn film on it. This does not happen to any of my other kits (PDP Concept Birch, Concept Maple, Mapex Saturn, DW Collectors, Yamaha Recording Custom, etc.) So, I don't think it has to do with the environment these drums stay in. I also don't see any issues with the chrome on the kit. It only happens to the painted surfaces of this kit, and this kit alone. Is this some sort of "off gassing" or "aging" of the paint. Is this supposed to happen? Will the paint begin to yellow over time because of this? What's the deal with this paint? Below are some photos where I have wiped off some of the film and left some on. It's gotta be some kind of condensation or exposure to moisture. exactly what i think.it's possible that,for some reasons, this specific translucid laquer kind of act like a magnet to moisture,and maybe because of this specific color ,it's more apparent. my kit is anthique sunburst ,similar to yours,and it really catch anything humid dust-moisture ; a thin film is developping in about 2 months or so......never witnessed this particularity with wraps, or natural finished drums. But I keep all my drums in the same place and this kit is the only kit that has this issue. Why would the reference kit "collect moisture" when the other kits don't do this and all look pristine and shiny? I think there is something "different" about the way Pearl does their finishes that is causing this to happen. Does Pearl use a nitro-cellulose lacquer on their kits? My thought was that this is some sort of lacquer off gassing that is happening. 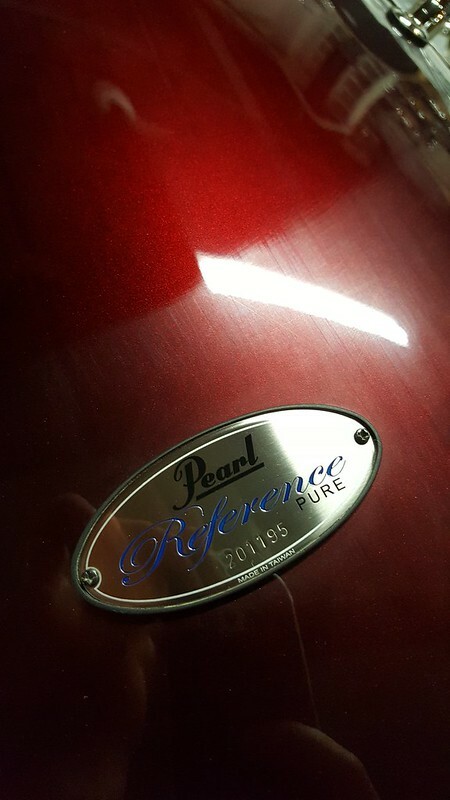 It used to happen to my Masterworks kits, and Pearl turned me onto Trick Drum Polish. The Trick Drum Polish remedies the situation rather quickly, but it still doesn't explain the forming of the film. My house was always on the dry side (30-45% humidity). I agree that the problem is moisture. The moisture could be caused by moisture in your room or moisture in the lacquer itself. 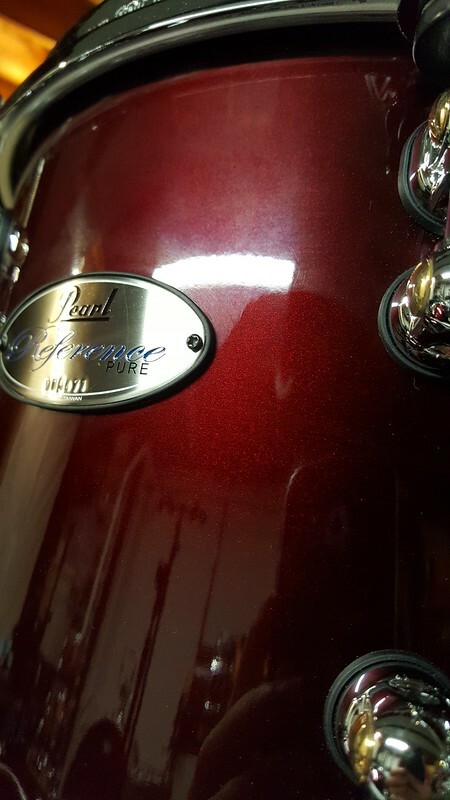 If your drums were sprayed where there was high humidity, the moisture can be trapped in the lacquer. That would explain why the rest of your drums don’t show the residue. It looks like the film of "muck" that collects on the inside of my house windows - you only see it when the sun in shining through the windows. Regardless of regardless; this film haze should not happen. At least you can claim your drums have an identifying trait to them. I live on the water in swamp land. Water everywhere. Plus rain rain rain! Better not happen to my References; my kit cost close to 5,000. I've had numerous Pearl kits with lacquer finishes over the past 30 years and haven't had this issue with any of them (either inside or outside of storage). I mean, we're not talking about the end of the world here, but it is annoying to have a $4000 kit who's paint looks crappier than my $400 PDP Concept Maples. If there is one thing I have learned it's that more expensive drums do not mean better drums. My Mapex Saturn's are still, bar none, the best built and finished set of drums I have ever owned. My PDP Concept Maples sound just as good as my DW Collectors kit did and that's why I sold the Collectors. My PDP Concept Birch kit has better cut bearing edges than this Pearl Reference Pure and all of them have a better paint finish. So suffice it to say, "pro drums" are over-rated in my book. Last edited by Tommy_D; 01-09-2019 at 08:35 AM. I mean, we're not talking about the end of the world here, but it is annoying to have a $4000 kit who's paint looks crappier than my $400 PDP Concept Maples. If there is one thing I have learned it's that more expensive drums do not mean better drums. My Mapex Saturn's are still, bar none, the best built and finished set of drums I have ever owned. My PDP Concept Maples sounded just as good as my DW Collectors kit and that's why I sold the Collectors. My PDP Concept Birch kit has better cut bearing edges than this Pearl Reference Pure and all of them have a better paint finish. Although I have several Masterworks kits, the main reason is for the flexibility of choosing unique sizes, specific hardware, and a custom finish, as well as the pride of ownership (of a high end kit). The 12x8 all maple tom on my Masterworks kit doesn't sound any better than the 12x8 all maple tom on my Master MCT kit. If it was only about bang for the buck, I would settle for a lower priced kit with professional features. The variety of good quality heads available today also has a lot to do with how all drums sound. I'm not a car person, so I'm happy driving a 25K vehicle that does everything I need it to do. However, I can understand why somebody else might spend 50K or 150K for the unique features of a boutique vehicle or simply enjoy owning one.